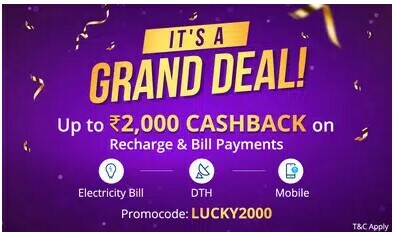 How To Avail Paytm Grand Deal & Get upto Rs 2000 Cashback? 1 .First of All, [eafl id="1779" name="" text="Download/Update Paytm App From Here"] 2.Login/Sign up to Your Paytm account. 3. Initiate a Recharge/Bill Payment of Rs 100 or More. 4. Apply Promocode – LUCKY2000 5. Once the Promocode is applied successfully, Proceed to the Payment page. 6. Pay the Amount using @Paytm UPI to Get Extra Rs 30 Cashback ( See Offer Here). Although, You are Free to use any payment method. 7. You will get cashback amount anything From Rs 10 (Assured) to Rs 2000. + Extra Rs 30 Fixed cashback, if you have paid through @paytm UPI Handle. 8. Valid Twice Per user per mobile number.